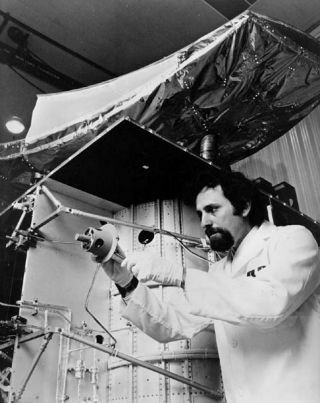 Joel Bacher, an RCA engineer, adjusts a propulsion thruster on a communication satellite. In this historical photo from the U.S. space agency, RCA engineer, Joel Bacher, adjusts a propulsion thruster on a communication satellite. The thrusters were designed to enable the spacecraft to maintain correct altitude control after it had achieved a 22,000-mile synchronous orbit over Earth. The satellite shown is an RCA Satcom domestic communication satellite that was launched December 13, 1975. The satellite was built by RCA Global Communication, Inc. and RCA Alaska Communications, Inc. This domestic communication satellite spurred the cable television industry to unprecedented heights with the assistance of a company known as Home Box Office (HBO). Cable television networks relay signals to ground-based stations using satellites. This allowed cable television to enter into the suburban and metropolitan markets, thus causing HBO to accumulate 1.6 million subscribers by the end of 1977.